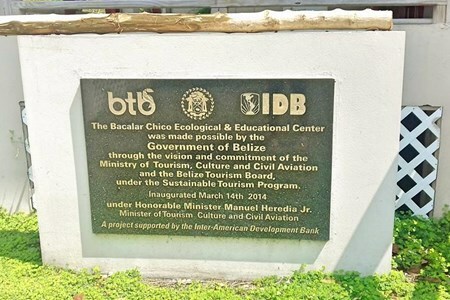 Our adventure begins as we depart the SEAduced by Belize located at the back Marina just down from the water taxi terminal. Departure is 9am. 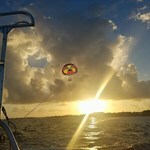 We begin by meandering through the lagoons ... moreand mangroves to a pristine sand bar. 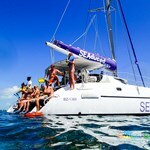 Once we set anchor it is time to explore! 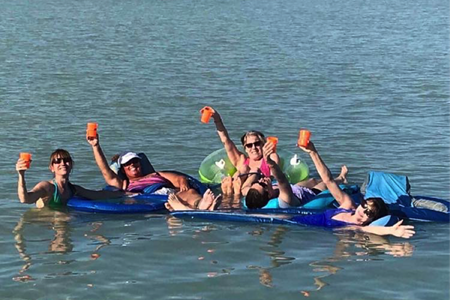 We have paddle boards, kayaks, fishing gear, water floaties and a slide. After you have had plenty of time to play we will serve lunch. Lunch is grilled chicken with peppers and onions, cilantro rice, black beans, tortillas and a variety of sauces and toppings. 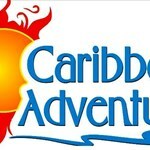 We also start serving beer, rum punch and signature mojitos with lunch. 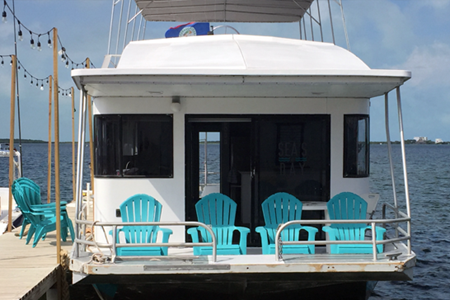 At about 3pm we left anchor and while we head back you can relax on the top deck and sip a cold drink or indulge in our homemade brownies and cookies. The experience starts from the moment we greet you to the moment we say goodbye. 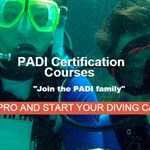 Our crew members are trained and experienced guides that will guarantee you fun filled day with your ... morefamily and friends. 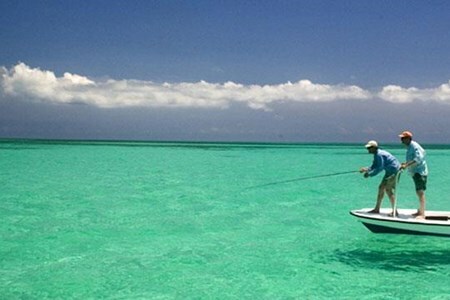 To kick off the morning we pick you up from your dock at 8:00 am and we head over to a spot along the reef for the best reef fishing. 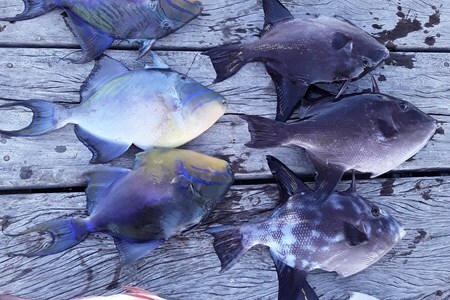 If you have never done reef fishing or any fishing at all, that’s is not a problem. It’s your option if you want to keep or release your catch, but let us tell you that the catch of the day is the freshest meal ever. 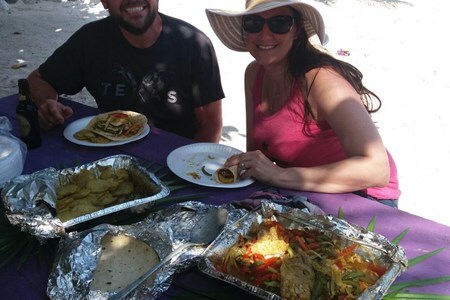 Then we move to a scenic and private spot along the shores of Ambergris Caye, where you can bask in the sun, sand, fresh Caribbean Breeze puffing on the palm trees and a delicious lunch freshly grilled right at the spot. 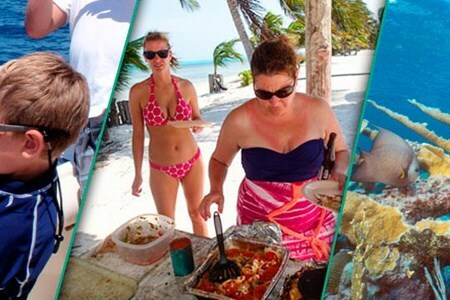 Great, now that our stomach is settled we move to Mexico Rocks or Hol-Chan, whichever is more convenient for you, for an awesome snorkeling on crystal clear waters. 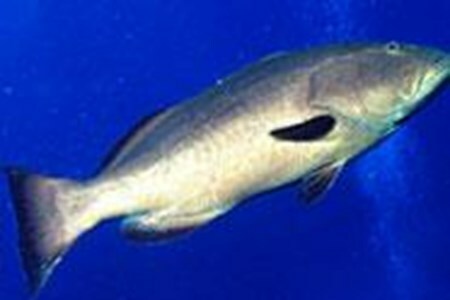 Both locations boast abundance in marine life. 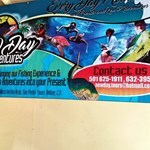 Mexico rocks, usually not crowded, features large corals formations and beautiful tropical fishes. 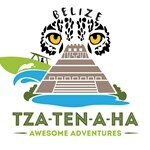 Hol Chan, since it’s a Marine Reserve, there are always tourists snorkeling there but offer the most exclusive snorkeling experience in Belize. With so much to see and explore. 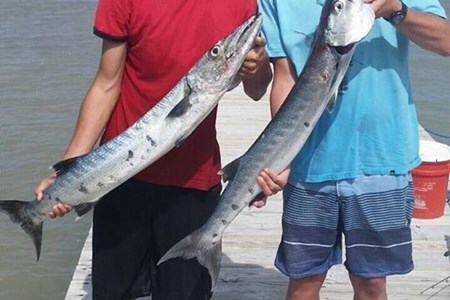 Fishing for barracuda, jacks, snooks, bonefish, tarpons and permits! 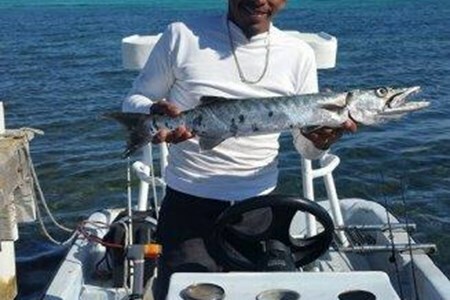 Not too far away, just about 10-15 minutes from our dock are the Ambergris Caye extensive grass flats and the lagoons ... moreknown for the barracuda, jacks, grouper, sharks and permits. These top of of the food chain predators are vicious and are sure to strike and give you an outstanding fight on a neat fly or lure. 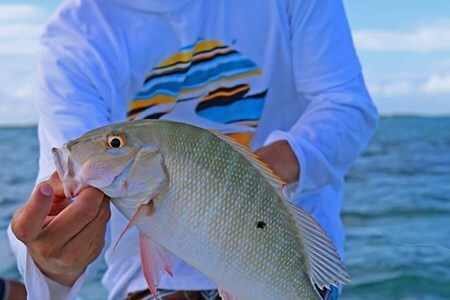 Morning fishing can be exceptional and the flats are only about a mile from the blue waters replenishing the flats constantly with fish bonefish, tarpons and permits. The experience starts from the moment we greet you to the moment we say goodbye. 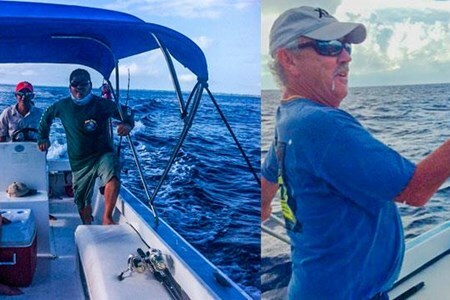 Our crew members are trained and experienced guides that will take you to Belize’s best fishing spots ... morealong our reef. 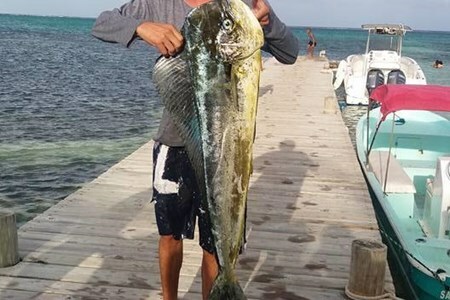 Caribbean Breeze Tours can assure you that you will have a catch on this fishing trip. 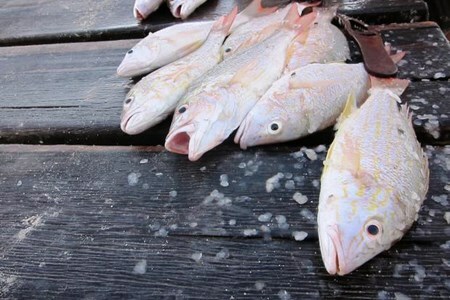 Fish the entire day and have our guides cook the catch for you! 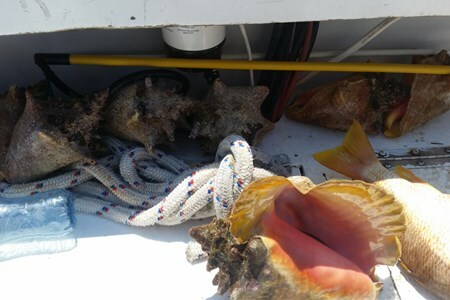 Our reef fishing is done inside and outside the reef and channels, where there is sufficient fish that move in and out of the reef looking for food. 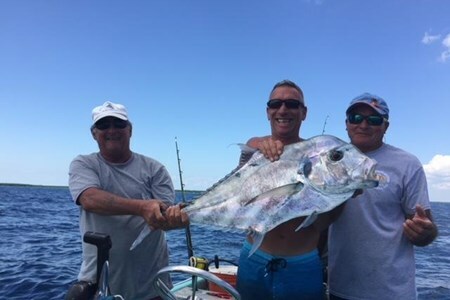 Our fishing guides will take you along the reef to spots where they have fished for years and they know you will have your catch.